Use the attribute panel to add attributes to map items belonging to the “Administrative division” category. The available types of administrative divisions form a hierarchy: every division includes divisions of an equal or greater level within it. For more information, see Section 3.2.2.3. Parent division. On the assignment of names, see Section 3.1.3.1. Types of names: General rules and 3.1.3.2. Rules for entering all types of names. This name type is mandatory. The full name of the division that is recognized in that country. Usually it includes the type of map item. For the rules of writing names of this type, see Section 3.1.3.1.1. Official. Use this field if the item's caption on the map should differ from its official name. See the rules for writing names of this type in Section 3.1.3.1.2. For the caption on the map. If map items of various sub-types (like a locality and a rural settlement) located nearby have identical proper names. If the proper name itself (without the type) is not sufficient to identify the item. In these cases, the caption name should include an abbreviated type name. See Section 3.1.3.1.5. Previously called. See Section 3.1.3.1.6. Also known as, historical. Enter this name for administrative divisions if their address name differs from their official names. See also Section3.1.3.1.3. The address contains. The “Parent division” panel indicates the administrative division that is one level above the item you are adding. This is how the administrative division hierarchy is formed on the map. Every division (other than those on the highest, country level) should belong either to a division at a higher level or to a division at the same level that encompasses the item in question. If there are several divisions of the latter type, select the one with the smallest area as the parent. Thus, the position of the administrative unit in the hierarchy is not completely determined by the value of the attribute 3.2.2.1. Type (level): at the same hierarchy level there can be units with different attribute values, and vice versa: units of the same type can be at different levels of the hierarchy. When administrative divisions of the same type belong to different hierarchy levels, it is referred to as division nesting. Some items may have two positions in the administrative division hierarchy. 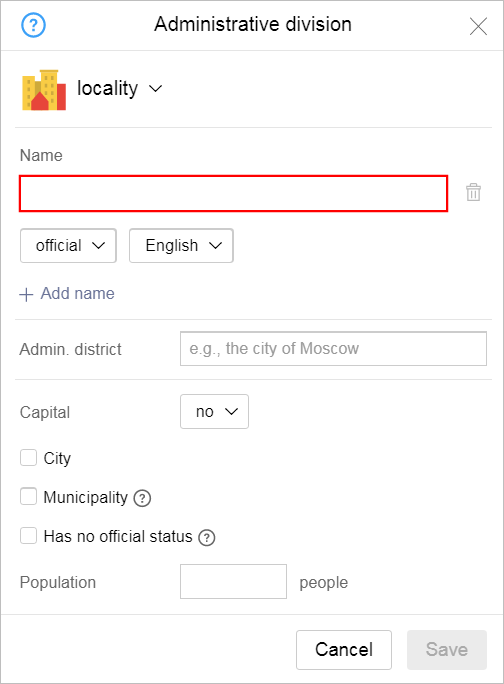 For example, Moscow is both a level 4 (locality) and a level 2 (sub-federal unit). Additionally, sometimes levels can be skipped in the hierarchy. For example, a block (level 7) can have a parent division that is a level 4 “locality” (for more information, see point 3.2.2.3.7). Divisions at this level can not be created or edited on Yandex Map Editor. They function solely as items that lower-level administrative divisions can be linked to. Second-level administrative divisions can be nested. Examples of second-level administrative divisions in various countries can be found in the above table. 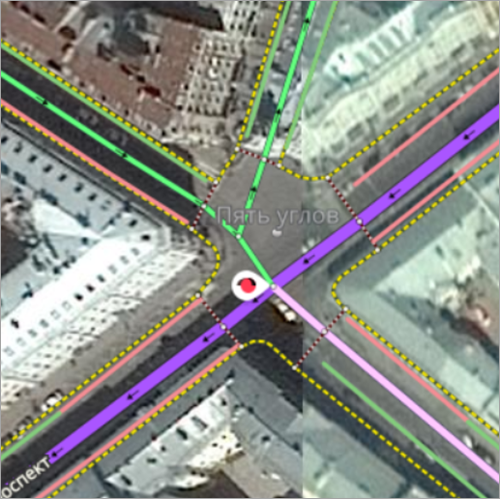 Second-level divisions can not be created or edited on Yandex Map Editor. They function solely as items that lower-level administrative divisions can be linked to. The parent division for districts is the region (level 2). Level 3 divisions are the parent entities for individual “Localities” (level 4) located on their territories. The locality level of the hierarchy includes cities, villages, towns, etc. This level always includes gardening co-ops and rural (dacha)settlements. Level 3 (“Districts”) map items are the parent urban/rural areas that these level 4 localities belong to. If there are no urban or rural settlements, then the municipal district or city region that the locality is located on will function as the parent item. Level 4 items are the parents of level 5 (City districts) and level 7 (Blocks) administrative divisions. Localities within other localities are also classified as Level 7 (Blocks) divisions. Localities (Level 4) are the parent items for level 5 items. Nesting is allowed for city districts. Unofficial territories within localities that have borders and established informal or historical names (i.e. the name doesn't adhere to any classification system, but is rather a proper name). Former villages, farmsteads, towns, and cities that are located on the territories of larger localities whose names are used in addresses. Former villages, farmsteads, towns, and cities that are located on the territories of larger localities whose names are not used in addresses, but still have standalone structures and can be used as landmarks. Residential areas, towns, and villages located on the territory of localities that do not have an official status but are referenced as citywide landmarks in official documents and used in transport stop names, media, and advertising (by officially registered mass media organizations and advertising agencies). If you are not sure what an item's type is, give preference to whatever one is used in local government documents. Territories of sports complexes (including ski trails, race tracks, and and athletic fields), recreation areas (resorts, country hotels), industrial parks, factory clusters, and active military cities that contain named passageways and addresses within the item itself. For level-7 Blocks, enter the administrative division with the smallest territory (other than named territories) that completely encompasses that block. If the administrative unit is not the administrative center, leave the default value in the field. 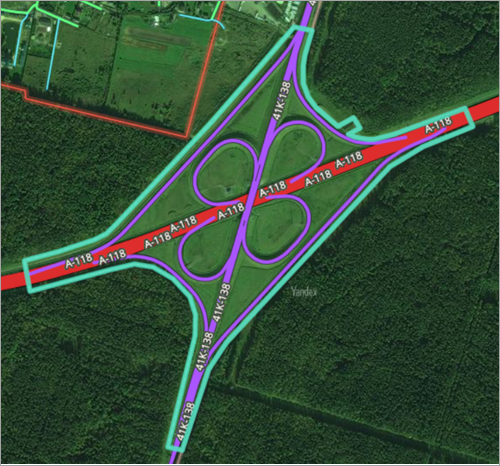 : “No” (according to local laws, it is not an administrative center). Countries — capital of the country. There can only be one locality with the “Center: country” attribute on the territory of a state. Regions — administrative center of the region, province, territory or republic (see Section 3.2.2.3. Parent division). Regional district — the administrative center of the regional district, municipal district, urban district (see section3.2.2.3. Parent division). 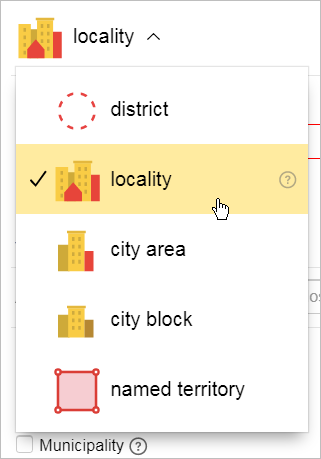 If an administrative division of the “Locality” type is a city, then check the box in the City field. Check the box in the Municipality field if an administrative division is a “municipality” that has its own address system (i.e. there are no independent official localities within its borders). These municipalities are the parent items for all elements with addresses on their territories (streets, blocks, farmsteads, neighborhoods, individual addresses). Even though these municipalities are not officially localities, they should be assigned to the “Locality” hierarchy level. For example, communes in France, quarters in Turkey, etc. In other cases, do not check the box. “Locality”: gardening collective, dachas (village homes), rural settlements, free-standing homes or groups of homes that have proper names, other individual localities that are not included in official registers of localities. For example: Vega Residential Complex, Parus Residential Complex. Don't check the Has no official status box for any other administrative divisions. This includes items of the “named territory” type: by definition these items already have no official status. The term "population" refers to the number of registered inhabitants in a given locality or other administrative division. Use statistics published by state agencies or found on the official sites of local administrative entities to determine what the population of an area is. Don't fill out the “Population” field for gardening co-ops, or rural (dacha) settlements that do not have permanent registered residents (or for which there is no data available).